“Don’t Worry, He Won’t Get Far on Foot” (2018). 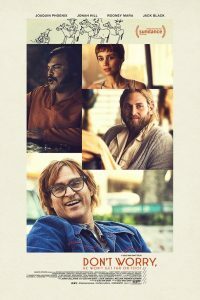 Cast: Joaquin Phoenix, Jonah Hill, Jack Black, Rooney Mara, Carrie Brownstein, Tony Greenhand, Beth Ditto, Mark Webber, Ronnie Adrian, Kim Gordon, Udo Kier. Director: Gus Van Sant. Screenplay: Gus Van Sant. Story: John Callahan, Gus Van Sant, Jack Gibson and William Andrew Eatman. Book: John Callahan, Don’t Worry, He Won’t Get Far on Foot. Web site. Trailer. For years, John Callahan (Joaquin Phoenix) lived to drink. He held down various mundane jobs to acquire the cash he needed for his frequent trips to the liquor store. And, by night, he routinely sought out invitations to parties at which he would binge well on into the wee hours. 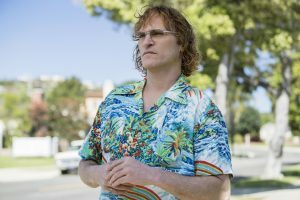 Alcoholic John Callahan (Joaquin Phoenix) spends years living to drink in director Gus Van Sant’s new biopic, “Don’t Worry, He Won’t Get Far on Foot.” Photo by Scott Patrick Green, courtesy of Amazon Studios. But that all changed one fateful night when John left one party to attend another bash with a new drinking buddy, Dexter (Jack Black). On their way to the event, the duo stopped for multiple rounds of shots at a bar, followed by an impromptu visit to an amusement park (surely the ideal place to go after hours of imbibing). However, having worn themselves out with drinking (and “purging”) all evening long, John and Dexter weren’t in the best of shape when they finally started making their way to their destination. Dexter was behind the wheel, but he was soon overcome by the alcohol, falling asleep and crashing his car. He managed to walk away from the accident with only a few scratches, but John was left paralyzed from his injuries. Now what? Waking up immobilized in a hospital, John was forced into coming to grips with his new reality. Faced with circumstances unlike anything he had ever encountered, he now had to make plans for what to do for the rest of his life. But what would that involve? John’s most immediate priorities were attending to his injuries and learning how to adapt to his new physical condition, a process that, though challenging, seemed to go better than what one might have expected. However, the emotional side of his ordeal was another story. Fortunately, John had a supportive team of caregivers working with him, most notably a kindly therapist, Annu (Rooney Mara), with whom he developed a professional relationship that had decidedly personal overtones. He also began attending Alcoholics Anonymous meetings at which he met a sponsor, Donnie Green (Jonah Hill), who welcomed John into his group therapy circle, albeit with hefty doses of tough love. And it’s there where the real work began. 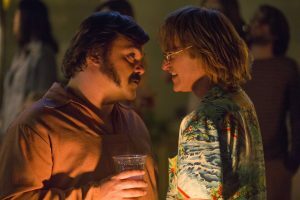 Drinking buddies John (Joaquin Phoenix, right) and Dexter (Jack Black, left) meet at a party and set off on a fateful, tragedy-ridden evening in the new film biography, “Don’t Worry, He Won’t Get Far on Foot.” Photo by Scott Patrick Green, courtesy of Amazon Studios. John struggled with staying sober, largely because group therapy forced him into some difficult personal work – discovering why he began drinking to the point of incoherence in the first place, a practice that started in his teens. But, despite this arduous task, answers started coming to him as he worked his way through the program’s 12 steps. He gradually began recognizing and dealing with his personal demons, making it possible for him to remain free of drink. One of the most important steps of this process, though, was figuring out what to do with himself going forward. Having retained partial movement in his arms, John discovered a knack for drawing, particularly cartooning. He had a distinctive style, to which he added his singularly outrageous wit, a scathing sense of humor that took no prisoners and frequently caused offense. However, many found his sketches refreshing, hilarious and insightful, qualities that soon earned him widespread recognition and publication in numerous high-profile periodicals. The lemonade was at last flowing. 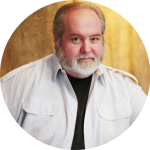 John’s experience provides a prime example of illustrating how our reality comes into being through the conscious creation process, the means by which we manifest our existence through the power of our thoughts, beliefs and intents. But, given the tragedy and challenges he went through, one can’t help but wonder why anyone would create what he did. 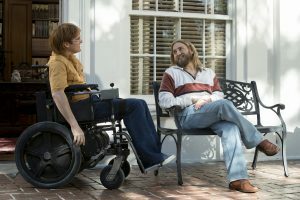 After a tragic accident, recovering alcoholic paraplegic John Callahan (Joaquin Phoenix, left) joins Alcoholic Anonymous under the sponsorship of fellow member, Donnie Green (Jonah Hill, right) in the inspiring new biopic, “Don’t Worry, He Won’t Get Far on Foot.” Photo by Scott Patrick Green, courtesy of Amazon Studios. For much of his life, John was a sleepwalker, paying little conscious (or conscientious) attention to his life and why it was materializing as it did. In essence, he was purposely numbing himself through his binging, putting off dealing with who he was and the nature of his experience. Getting his next drink is all that mattered. Seeking an outcome with no disregard for the fallout or the process of getting there is the antithesis of conscious creation, a practice known as un-conscious creation or creation by default. However, as the years went by, John clearly could not continue as he had been. The prospect of alcohol-related illnesses and other associated perils, for example, loomed large unless he got sober. He had to stop, and then he had to figure out why he started, both of which had their roots in his beliefs about himself and about life. For various reasons, Callahan had never taken the time to address these issues. The difficulty involved was more than he could bear, so, rather than address his challenges, he chose to defer doing so by escaping into inebriation, supported by beliefs that made this outcome possible.  On some level, though, he knew he could not stay on that course – and hence needed to create circumstances that would get him unstuck. Kindly therapist Annu (Rooney Mara) does her best to bring hope and encouragement to a newly paralyzed paraplegic patient in director Gus Van Sant’s latest offering, “Don’t Worry, He Won’t Get Far on Foot.” Photo by Scott Patrick Green, courtesy of Amazon Studios. Many of us would probably look upon John’s “solution” to this dilemma as somewhat drastic. However, it’s also apparent that he was not getting the message about the need to make a change when it came to him in a less dramatic fashion. As much as we might disagree with his decision, he needed to create sweeping change in his life that would undeniably force him in a new direction. And, by being immobilized, he now had no other distractions to keep him from setting about the task of sorting out his life and beliefs. In unraveling how he got to the point he was at, Callahan first had to come to understand how his beliefs shaped his existence. In essence, he had to become “conscious” of the conscious creation process. And, with the acquisition of such awareness, he then had an opportunity to see how to apply the technique in manifesting the reality he experienced. This was true for seeing both how he got to where he was, as well as to project where he wanted to go from there. Realizing that he was still capable of making a contribution to existence despite his paralysis, John tapped into his cartooning abilities, a skill brought to life by beliefs that made the emergence of this talent possible. Even though his style did not appeal to everyone, on some level, he knew that there were those he would appreciate it, a belief that brought him the success he attained. But the accolades he achieved represented something larger than just his abilities as an illustrator; they were evidence of his worth as a human being, something that for years had been buried under a belief-based unwillingness to recognize said fact (not to mention a pile of empty liquor bottles). Callahan’s story is truly inspiring, detailing the remarkable efforts he made to get clean and to build a life and career for himself in the wake of a horrendous tragedy. He shows us that we really can turn things around if we put our minds to it, tasking though the process may be. However, the potential rewards that come from such ventures are immeasurable, proving that we have worth and are capable of making tremendous contributions professionally, personally and, above all, courageously. As film biographies go, “Don’t Worry, He Won’t Get Far on Foot” is generally well made and features excellent performances by Phoenix, Hill and Black. Director Gus Van Sant’s latest sports a wicked sense of humor and more than its share of heartfelt moments. Unfortunately, it has something of a tendency to lose its way in the second half, particularly when it comes to addressing Callahan’s efforts at working his way through the 12 steps. 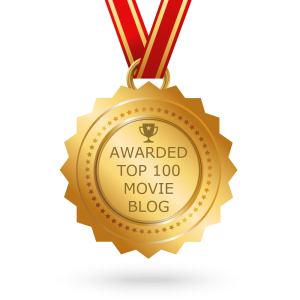 While the overall direction of the story is apparent, the script meanders somewhat at a time when the focus should be clearer and more direct. See this one for the performances, its wit and its inventive animation, but try not to be too let down by some of the lapses in the narrative. Navigating the shoals of our existence can undoubtedly be troublesome. But it is possible to maneuver our way through as long as we make a concerted effort to stay the course. John Callahan shows us how to take the wheel, even when such an endeavor seems impossible – and how to make some of the sweetest lemonade possible.